Is Granola Really a Health Food? Home » Food and Nutrition » Is Granola Really a Health Food? 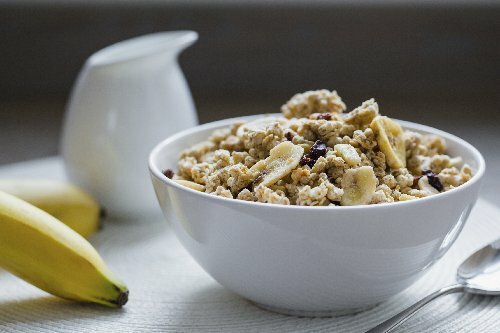 When you think of a healthy snack or breakfast component, would it be a stretch to suggest that granola comes to mind? You can eat it as a trail mix, in wholesome-seeming cereal, as a supposedly healthy sweet treat with fruit and yoghurt, or in bar form, usually manufactured by a company with a natural-sounding name that makes you feel good. But is granola really a health food? It seems ludicrous, I know, but the truth is that granola—at least today’s incarnation of it—is more like a dessert than a breakfast or healthy snack. I’m sorry to burst your bubble. It wasn’t always this way, though. When nutrition advocate Dr. James Caleb Jackson developed granola, it was a healthy recipe. It featured dense, unsweetened bran nuggets that were rich in nutrients and fiber. It was a healthy snack or additive to breakfast cereal. But oh, how the times have changed! Today’s commercial brands—and even popular at-home recipes—are packed full of sugar, making them about as healthy as a donut, a slice of chocolate cake (with frosting), or a cup of ice cream. Put quite simply: granola—whether in bar, cereal, or sprinkle form—is not a health food. In fact, it can be very dangerous. Added refined sugar—whether it’s honey, high-fructose corn syrup, or table sugar—has toxic effects on the body. It can lead to metabolic problems and promote weight gain, heart disease, liver and kidney problems, and type 2 diabetes. This might be hard to believe with certain healthy-sounding brand names and the fact that granola bars are promoted as a healthy snack for people with healthy lifestyles…but they might actually be killing you. How Much Sugar Is in Granola? And, I know for sure you’d laugh in my face if I claimed that those were health foods. But looking at the added sugar content, they are actually healthier than some renditions of granola bars or cereals. So, if you’re thinking that adding some granola to your cereal or yogurt is doing anything other than adding dangerous sugar, I’m sorry to tell you it isn’t. So, ditch the granola bars for fresh fruit, whole grains, or something that isn’t candy wrapped up in a healthy-looking package! O’Connor, A., “Why Your Granola Is Really a Dessert,” The New York Times, August 30, 2016; http://www.nytimes.com/2016/08/30/well/eat/why-your-granola-is-really-a-dessert.html?_r=0, last accessed September 6, 2016.